If you want to deliver customized messages to thousands of customers via SMS, E-mail or Voice calls, but you don't want to share your customer database with a service provider, Ozeki Bulk Messenger is the right product for you. 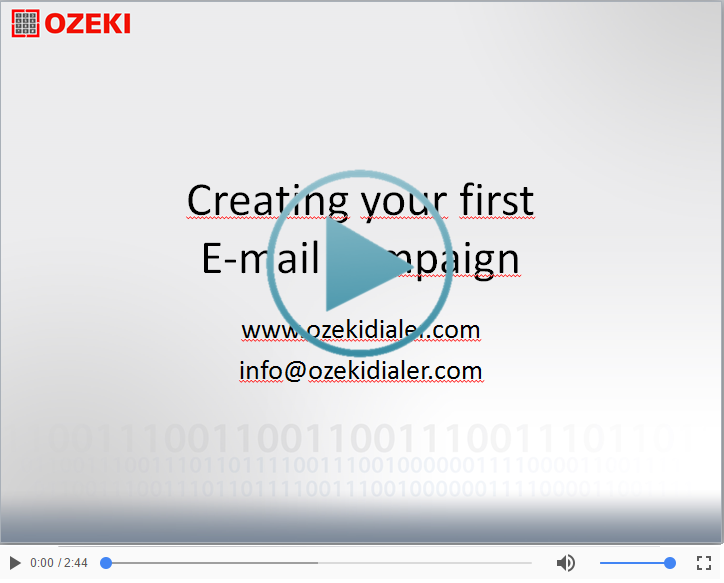 Install Ozeki Bulk Messenger to your PC or mobile phone and send SMS, E-mail or make Voice calls more efficiently! You may also combine (add or subtract) multiple address books to get the right list of contacts, and you may make a copy and customize the contact details before message delivery. If you install Ozeki Bulk Messenger on an Android mobile phone, you may use the contact database of the mobile phone itself. Deliver personalized information. 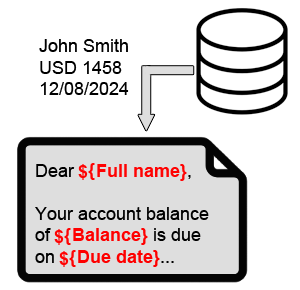 Use data stored in your database (or in Excel files) to make each message you send unique. This feature is useful if you wish to send out information suche as account balances, delivery dates or address information. #1: Install Ozeki Bulk Messenger on Windows or Linux and attach an SMS modem to the computer using a data cable. You may install Ozeki Bulk Messenger directly to your Android phone. You can use it from the phone-s touch screen or you may connect to it from a remote PC. Seting up G-mail is very easy, but if you wish to use Ozeki Bulk Messenger in a company, you might want to use your company's mail server instead. If you don't want to use Gmail, you can use the SMTP service, provided by your Internet service provider or if you have a company mail server, such as Microsoft Exchange or Linux sendmail/postfix/etc you can use that. Note that based on our experiences all Internet service providers offer SMTP service in most cases free of charge. Simply call them and ask for the connection details to their "smtp server" to send out e-mail messages. Ozeki Bulk Messenger offers both secure and standard SMTP connectivity. To setup SMTP for E-mail please take a look at the following instructions. You can make voice calls throught a VoIP GSM gateway or a VoIP PSTN gateway. The VoIP GSM gateway connects your system to the mobile network. The VoIP PSTN gateway connects to the land line. Almost all companies use some kind of a VoIP PBX system, such Asterisk, Cisco or Avaya. You can use Ozeki Bulk Messenger to make Voice calls through this system. How to setup a VoIP PBX for Ozeki Bulk Messenger. Another option to make voice calls is to connect to a VoIP service provider over the Internet. When you sign up for the service you will receive the settings needed to configure Ozeki Bulk Messenger.